Ambiance – After discovering her husband’s illegitimate child resulting from a lengthy affair, Ambiance’s world was torn in two. His untimely passing leaves her feeling she has been robbed of the chance to deal with the betrayal. Seeking to give herself a fresh start, she packs up and moves cross country to the West Coast. Finally pursuing her dreams as a business owner in the fashion world, she’s on top of the world, until the man who caused her to question her marriage comes knocking. Will he mend her broken heart, or will she cut all ties to her past? Naomi – Dealing with empty nest syndrome, she discovers everything everyone ever said about her is true. She has no life. Embarking on a journey of self-discovery and entering the dating world after years of being alone, she’s unprepared for the games that lie in wait. Juggling her feelings between two very attractive men, she will soon learn that one is playing a very deceptive game. Paige- Barely escaping a deadly snare created by her own devices, she is searching for healing and redemption. After two years of therapy, Paige is finally ready to face her demons. It won’t be as easy as it seems, when accusations are constantly launched at her, and people from her past continue to pop up. A lover from the past is not ready to let go, and she soon finds herself making similar choices from her past. Will she open her heart up to love and be loved, and will she be convinced to open her life to Christ? Three best friends search for healing and deliverance from their emotional wounds in the arms of men, and the arms of a Savior. Ambiance – Loving her husband, building her brand, and being there for her girls are the only things that matter to her. But she’s quickly learning that her love is not enough to build a strong, stable marriage. Surrounded by family, friends and business constituents should be enough; yet, she’s all alone. When her love isn’t enough to suffice her husband’s needs, Ambiance considers stepping beyond the vows and taking matters into her own hands. The tragic results will have her running into the arms of the Lord. Naomi – As a teen she made the decision to be a single mother. Choosing to build her life around her daughter has molded and shaped all the decisions she has made until now. Her relationship with her daughter is highly valued and nothing can shake it, not even her daughter’s attempts to grow up. But when her daughter’s so-called “deceased” father comes back, Naomi’s carefully constructed world may begin to crumble. Her efforts to protect her child may be the one thing that pushes her away, and she must decide if she will open herself up to love again. Paige- running from her inner demons she struggles to build a life vastly different than her mother and aunt’s. With a mindset of use or be used, she takes the concept of “love ‘em and leave ‘em” to a new level, and her promiscuous lifestyle is a cause of concern for all those who love her. She doesn’t care whose heart she’s breaking or whose life she’s ruining, it’s all about her. Until it no longer is. Three women are on a journey of self-discovery, as they deal with the fallout from choices made from emotion rather than self-awareness. 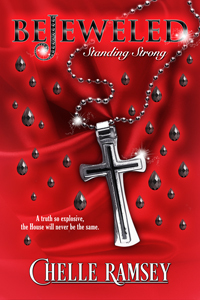 The last book in The House of BeJeweled series. Olivia has overcome many challenges and disappointments in her life. Yet, when faced with an unexpected death of a family member, and witnessing the murder of someone she cares for, she isn’t sure she can survive. The losses incurred on this journey may cause her to pay the ultimate sacrifice. The return of Black and Kianna means the puzzle pieces of Angel’s life are finally locking into place. The picture is different than she envisioned. Angel must determine if uncovering the truth of their past, is worth the sacrifice of her new relationship. Kianna’s played dirty in the past, but this time the fight is deadly. She’s willing to go all in to expose the truth, which will cause everyone in the game to ante up. Will her sacrifice be more than she bargained for? Black’s gambled several times in the past, but this time the stakes are high. With his life and those of his family serving as the bargaining chips, it isn’t that easy to fold. To protect those he loves the most, he may have to sacrifice his own life to save theirs. Angel. Kianna. Black. In the end everyone must bear their cross. And the truth is so explosive, the House will never be the same. One will stand strong and walk away. One will stand strong and make the ultimate sacrifice. And one will stand strong and won’t survive! Olivia’s dreams have finally begun to come true, as she marries the man who’s held her heart for twenty years. Her beauty salon is prospering, and she has begun rebuilding her team, after seeds of discord were sowed and bonds were broken. Everything is beginning to look up, or so she thinks. When a scandal is leaked to the media, Olivia’s dream of expanding is in jeopardy. She must step up and play hard ball in a game with which she’s unfamiliar. Nikki had dreams of building a beautiful family with a loving husband. But after looking at the shattered pieces of her broken life, she is losing hope and desires more. She wants more than the shame of barrenness, and more than physical abuse from his drinking binges. One phone call gives her courage to escape the deadly clutches of her husband. Yet, when she finds strength in another’s arms she finds herself spinning more lies. Nikki’s web of deceit is going to cost all those who are close and it could just cost her, her life. When deception is the name of the game, who all will have to share the pain? THE HOUSE OF BEJEWELED– the place all divas go in the ATL for the hottest hair styles and even hotter gossip. OLIVIA – the owner of The House of BeJeweled hair and nail salon faces the challenge of inspiring the clientele while helping her team of talented stylists pick up the pieces of their broken lives. Paired with their constant drama, she must now fight to keep her heart protected from the one man who has always laid claim to it. ANGEL – has put up with a lot from the man she loves. Is his latest betrayal the last straw or can love conquer all? Beware the rage of a woman scorned. Stop by for a visit and get your hair cut or colored at BeJeweled, where the scissors are sharp, but the tongues are sharper. Five best friends seemingly have it all together, but when life changing events and temptation comes knocking, they must decide if they will hold on to who they are, or give in to the pressure and change their lives forever. Tamara Roman, professional dancer, dedicated mother and loving girlfriend enjoys the life she lives, until the ones she loves begin to question the choices she's made. With her parenting skills called into question and her relationship in jeopardy she has to make changes to her life plans. But will those changes result in her demise? Darren, Tamara's boyfriend, realizes his love for his son and girlfriend continues to fall short of both their expectations. After an altercation on the job sheds light on his home situation, he has a change of heart that will transform the direction his relationship is headed in. But will his attraction to another woman be worth the risk he’s willing to take for her? From the urban life to the suburbs, everything is not always what it appears to be. When the closet doors open, the bones will come tumbling out. What skeletons are they hiding in their closet? The handwritten note mysteriously appearing in her mailbox sends alarms throughout her and triggers a series of events she is not prepared for. She had worked carefully to conceal her past, yet somehow the rules changed and the barriers have been broken. Patricia must determine if she is ready to reveal the truth. As she balances the scales of right and wrong, she must finally face the destruction she has caused. Sometimes we make choices to avoid drama in life. But what happens when the road we take becomes the road that brings us face to face with it? I am an avid reader and enjoy a varied selection including drama, spiritual, inspirational, and fiction crime. Mysteries are my favorite books to read and I enjoy curling up with a good James Patterson or Stuart Woods novel. However, I can have deep discussions about a Teri Woods or Angie Daniels drama, or Nick Chiles & Denene Milner love story, with my book club members. Below is a link to my bookshelf on goodreads displaying books I love and book reviews.